What a nightmare! 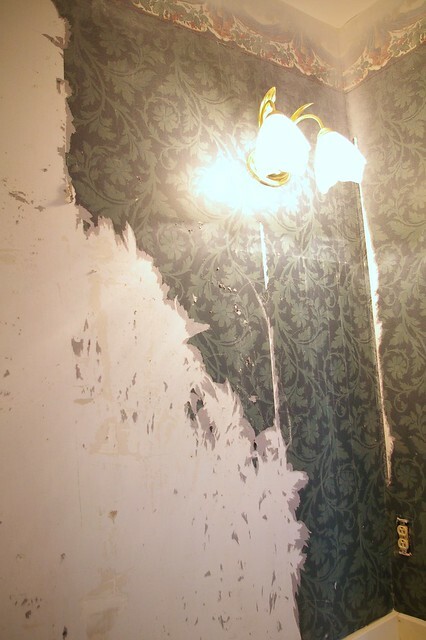 Original 90's wallpaper and gold fixtures. You can't tell, but that toilet paper holder was hanging on for dear life. After all the wallpaper was stripped, I re-finished the vanity by sanding and re-painting. It looks a thousand times better with a fresh coat of paint. I also repainted all of the trim. And... here are the AFTERS! I love how it turned out. In fact, looking back at the "before" I don't know how I lived with that for so long! Mirror - Wistera.com - $209.50 (it was on sale and now appears to be out of stock). And because I created my own art, I came in under budget! Eventually we'd love to put on a granite top (we have plans to put granite in the kitchen someday.. so we'll put the same granite in this powder room). Next up, the laundry room! looks lovely Bryn, very unique! and the texture is beautiful, great job! Fantastic, the grasscloth is to die for and all of the other elements are perfect. Especially the mirror, great to have it "done" I'm sure! I love the powder rooms new look. My parents first home had grass cloth in the hallways. I have always loved it. The Wisteria mirror is a beauty and your wall art is very creative. Looks beautiful! Doesn't it feel great to have one "finished" room? Stopped by your booth Friday and loved it! I may blog about it but the pictures I took w/ my phone turned out kind of crummy. . . It looks great! Kudos to you and your hub for removing the paper yourselves! UGH- it's such a hassle isn't it? The grasscloth is gorgeous! Looks great! Love the grasscloth! it looks so so good!!! I love everything about that bathroom!! It is so satisfying to finish a bathroom, because it's such a tiny space so you can finish it relatively fast and feel good and gain momentum for the rest of the house! I know, because I just finished our bathroom last weekend, too! I really love your light fixture AND the toilet handle! The little touches bring it all together. Great to see you can get new toilet handles in Lowe's, I want to get a silver one for my bathroom! Looks amazing! LOVE the grasscloth! Well done! Diggin' the light fixture and MIRROR!!! WOW! It looks fabulous. Love it. We have a half bath off our kitchen that we use a ton when we have friends over. I have a battery powered candle in there (a Christmas gift from my grandmother from QVC I'm sure). It has a light vanilla scent and I don't have to worry about a flame unattended for hours on end while we entertain! Very nicely pulled together. Looks beautiful! Amazing transformation! I love the grasscloth!! The mirror and art go beautifully with the space!! Wow, Brynn, it looks amazing. 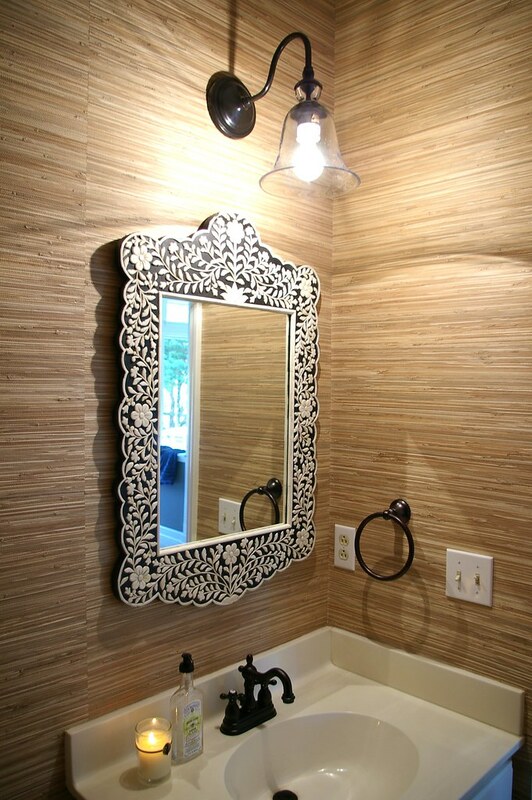 Love the grasscloth, the mirror and the pictures...love it all!! OMG, looks great!!! So simple, yet so elegant! Oh my goodness, Bryn. I love everything! The grasscloth, the mirror, the antique bronze fixtures, the vanity painted all fresh and white, the knobs--and the art is fab! I would happily have this exact room in my home. Wow, what a great transformation. I love the texture the grass cloth adds. How does it hold up for cleaning? this is such a beautiful bathroom! 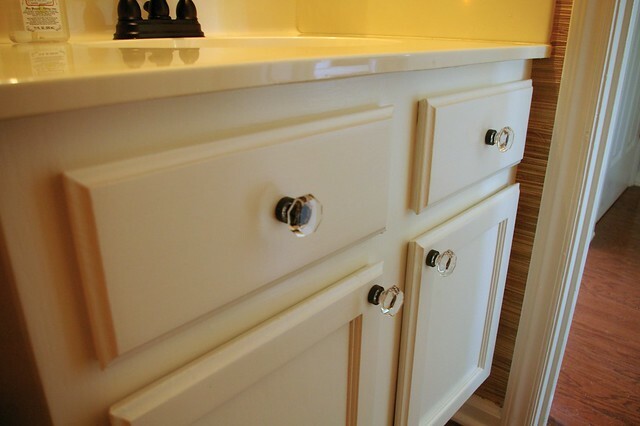 i love the faucet and the hardware on your cabinet! Beautiful!! The grasscloth is so perfect. And I'm still dying over the mirror. Being a neutral nelly doesn't have to be boring! I am high fiving you through the internet! Good job sister! WOW! Bryn it looks gorgeous!! Love every single one of your choices! It looks great, Bryn! I'm sure you could do a granite top so affordably -- it's small enough that a remnant would work. It's just as cute as can be, and very you. I'm so impressed! Well done. 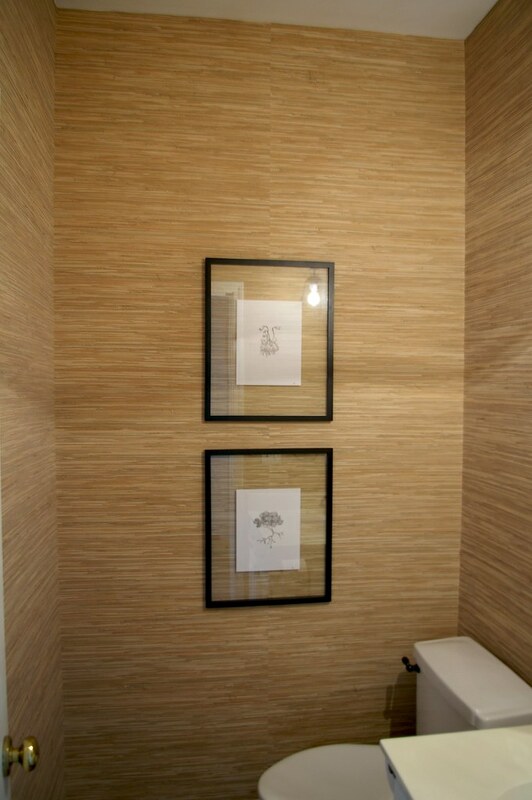 Your powder room looks fantastic! I love the grasscloth and definitely want to put it somewhere in our house! I love the bronze fixtures with the black and the contrast they create with the grasscloth! Beautiful! 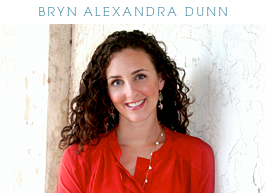 It is beautiful, Bryn! 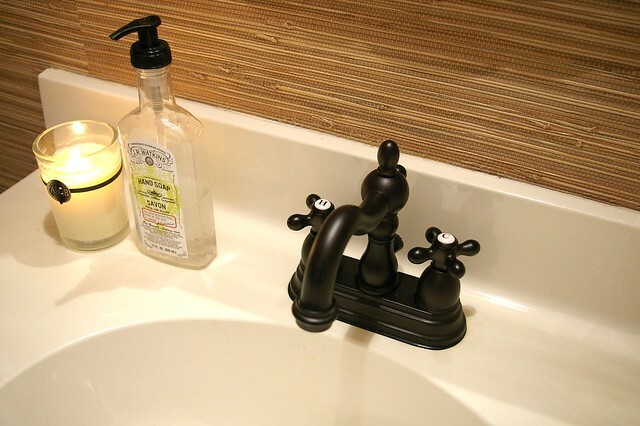 I especially love the faucet handles. One question, are the sockets and light switches beige? In the photo it looks like they are beige with white plates over them. Those can be easily changed out for white ones for a couple of bucks at a home improvement store. you caught me! :) Yes, the entire house has ugly electrical outlets/switches. They are either beige or have been painted over (??). They need to all be switched out, which is on the to-do list for someday along with the doorknobs and hinges. Bryn you did such a fantastic job!! I love how it turned out. I'm so excited to see what else you do in your beautiful home! Bryn- it looks great. I esp like the way the grasscloth looks behind the frames! Love the room! I really like how that mirror works against the grasscloth! Looks great, Bryn! You can't go wrong with grasscloth. Oh I definitely agree with you about the countertop!! I can't wait to upgrade it to granite. I wanted to replace the entire vanity, but there wasn't enough hardwood left over to match what we currently have. I think it will look good when we get a nice black granite in there. For now - the white will have to do :) I'm sorry it was a let down! It is a great upgrade, but i think you still can add some fun accents, maybe a little shelf and flowers above the toilet. Congrats...i love that you DIY everything!! I am absolutely dying over this bathroom. Bone inlaid mirror? Grasscloth wall covering? I could not be more in love! Great choices! Looks fab Bryn! I adore the grasscloth and the art really makes it. Thanks for sharing your sources! Looks great Bryn! I have grasscloth envy! Awesome! That is quite a transformation. I know I said this before but I just love how the frames are glass so you can see the grasscloth as the background for your art...so nice! Looks beautiful! Has to feel like a huge accomplishment! Looks great Bryn! I love the grasscloth. Good job on budget too! 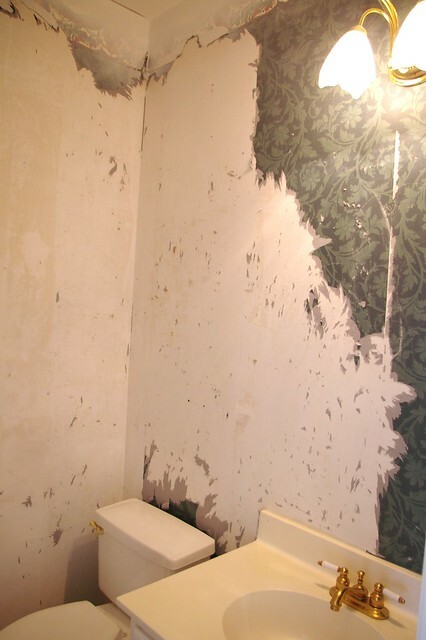 I don't envy you taking down all that old wallpaper though. That must have been a pain. LOVE it!! It's so fresh! 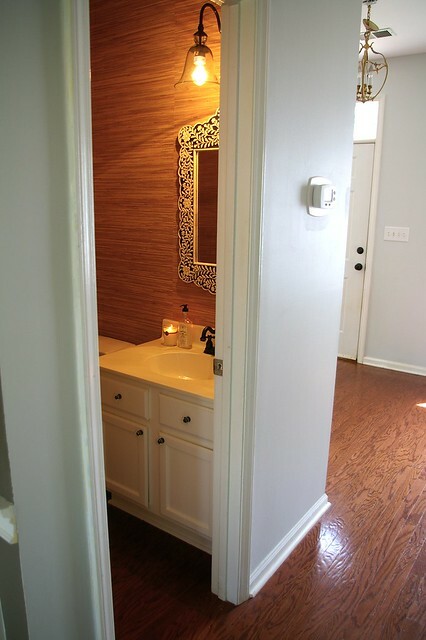 Love the fixtures and the grasscloth! 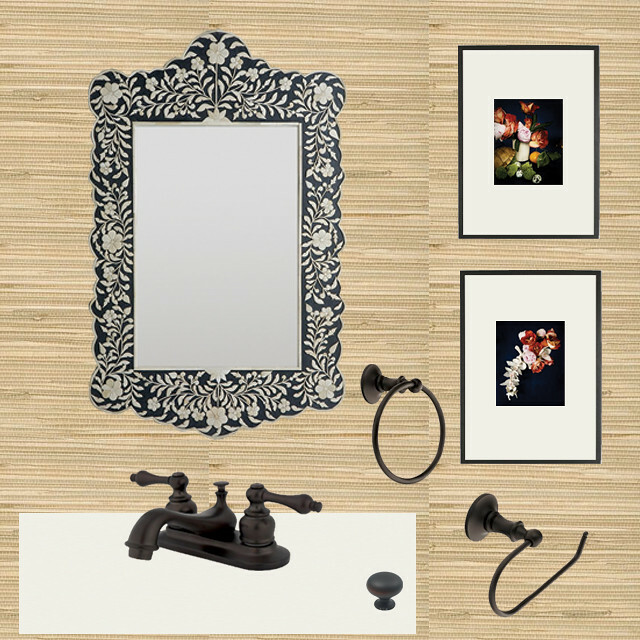 It's a fantastic mix of items from the intricate mirror to the simple frames to the textured grasscloth. And the pulls are perfect too. I'm shocked how much bigger the room seems to look! Looks so FRESH & CLEAN......i used to have this grasscloth wallpaper in my first home....back then ...7 yrs ago, i didnt like it. 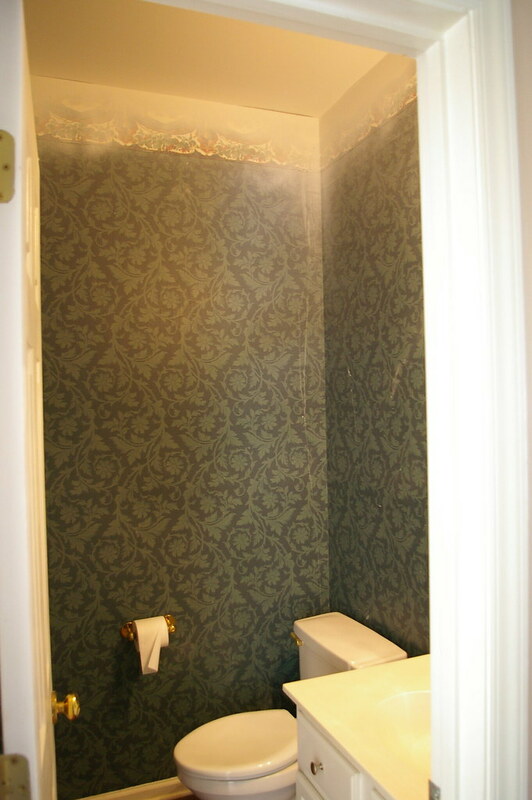 It seems like its super trendy now though :) I love the way it looks in the bathroom...and i know how you felt about wallpaper REMOVAL...iVE DONE IT and do not care to do it again! Dang...I can't believe you did all that for under a $1000.00! Beautiful! Great job! Looks phenomenal!! Love that grasscloth! LOVE IT! You have been a busy bee.